Very few carpet cleaning methods are totally suitable for wool, synthetic fibres and natural fibres such as coir, sisal or seagrass but the bone-dry dry organic carpet cleaning system is because it uses no water and, therefore, does not present the risk of shrinkage or seam splitting. Up to 85% of the dirt in carpets is dry dirt. In order to remove this, we thoroughly pre-vacuum with our powerful equipment. We will then individually treat all spots and stains to ensure they are completely removed and not just merged into the carpet during the cleaning process. 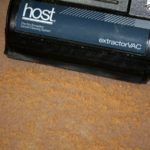 The remaining 15% of grease and dirt is then removed using our dry extraction machine with counter rotating brushes and the HOST™ natural organic compound. The HOST™ sponges are backed up with lots of data and tests that prove our claims, plus it’s a completely natural product! Convenient, because there is Zero Drying Time! You can use the cleaned area straight away. No need to empty the room of heavy furniture, leave windows open or be careful to avoid the room until its dry! As we said at the top of the page because we don’t use water there is no chance of shrinkage, seam splitting or bad odours – we just leave you with a bright clean, deodorised carpet featuring a rejuvenated pile. You are then free to enjoy the "new carpet feel" you first experienced when you first purchased the carpet all over again. Experience the "new carpet feel" all over again.